Dive under the sea and experience the animal kingdom in the big deep blue sea! 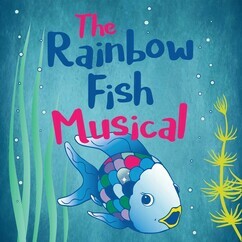 Based on the international bestseller and award-winning book, The Rainbow Fish , with its wonderful message of friendship and belonging swims with beautiful theatrical life! When Rainbow Fish, the most beautiful fish in the ocean, refuses to share her vibrant, shimmering scales, the whole ocean seems to turn against her. Unhappy that no one admires her anymore, the Rainbow Fish seeks out the wise Octopus, who helps her learn that it’s far better to be admired for being kind than for being beautiful. With a bubbly, energetic score, the universal message at the heart of this delightful musical becomes much more than just a simple children’s story.